As mentioned previously, I picked up a copy of Dragon Rampant. I've been curious about Lion Rampant and Dragon Rampant since they came out, especially since they seem to remain popular with a certain set of wargamers. As I was looking for reviews, I found I could order it from Target, of all places, and have it delivered for about $12. So I figured I may as well just pick it up and see for myself. Having freshly read through the rules yesterday, but not played a game yet, I've got a few initial impressions. I'd like to actually try a game or two before really forming a solid opinion. The game appears to be a large scale skirmish. Figures are 1:1, but in small groups or individuals. There are no formations, flanks, or complex maneuvers to be performed. Just measure, move, attack, etc. Attacks, damage, etc. are taken per unit, though. I imagine that gameplay is more or less the same whether you field 10 units or 10 individuals. Army building is fairly open. Choose from a list of unit types and add optional abilities to fine tune a unit. Each unit type & ability has a point value, allowing points based armies. One thing that strikes me as odd is the Battered status. When your unit fails their morale and becomes Battered, it's more like being "pinned" and frozen in place than fleeing. I've previously pondered whether Kings of War would be a good "gateway wargame" to get friends into wargaming for the first time, but after reading through Dragon Rampant, it seems like a much more accessible first time game. Not that KoW is complex, but DR doesn't deal with advantages of maneuver, and special rules are largely modifiers to the rather simple core mechanics. That said, I can see Dragon Rampant as a fun "beer & pretzels" game, but I'm not certain how well it would satisfy my desire for more complex (yet still streamlined & elegant) games. 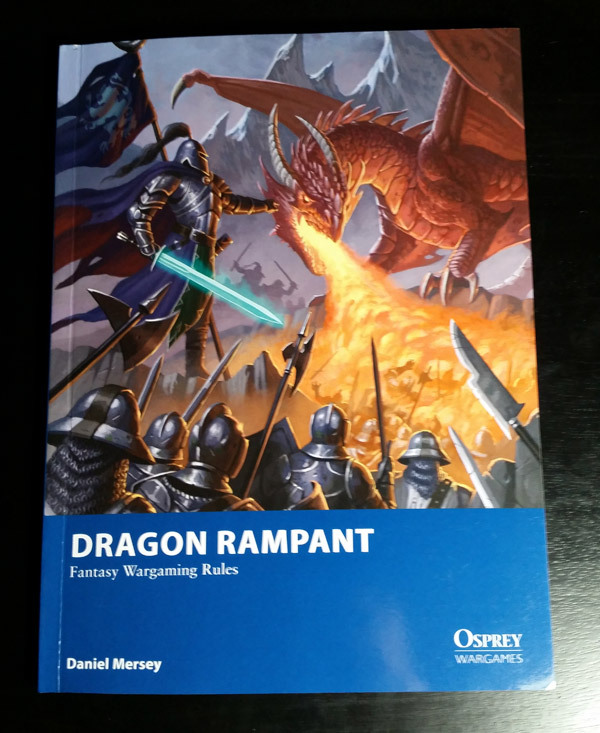 I've really enjoyed Dragon Rampant - and any games by Dan Mercy. I am interested to hear your thoughts after you've played a game. It seems very Hordes-of-the-Things-ish to me, but with more toys and less rigid basing system. One thing we did was allow the leader to confer a +1 on activations (as well as +1 to morale rolls) to troops within 12". The points & unit types reminded me of Hordes of the Things, but I think the rest of the game is quite different. A lot more free flowing in terms of movement & position, and there's less focus of what unit types match up against each other. Or at least it seems that way at this point -- before playing.